Earnings-to-price ratio (earnings yield) stands out as a useful indicator of country-level stock market gross value premiums (see the chart below). Momentum strategies are unreliable at the country level, effective only in small markets and counterproductive in large markets. Low-debt markets, especially large ones, tend to outperform high-debt markets on a gross basis. Illiquid markets tend to outperform liquid markets on a gross basis. A positive volatility-return relationship concentrates in large markets. Quality and volatility factors perform very differently in open and closed markets. Most return patterns are uneven across the five quintiles, with abnormal returns concentrating in extreme markets. B/M – highest minus lowest book-to-market ratio quintiles. E/P – highest minus lowest earnings yield quintiles. CF/P – highest minus lowest cash flow yield quintiles. DY – highest minus lowest dividend yield quintiles. Cap – smallest minus largest market capitalization quintiles. Mom12 – highest minus lowest return over the last 12 months quintiles. Mom9 – highest minus lowest return over the last 9 months quintiles. Mom6 – highest minus lowest return over the last 6 months quintiles. Mom3 – highest minus lowest return over the last 3 months quintiles. ROA – highest minus lowest return on assets quintiles. Lev – lowest minus highest leverage ratio (indebtedness) quintiles. Liq – highest minus lowest corporate liquidity (cash holdings) quintiles. Turn – lowest minus highest share turnover (market liquidity) quintiles. SD – highest minus lowest standard deviations of returns quintiles. VaR – highest minus lowest value at risk quintiles. Ivol – highest minus lowest idiosyncratic volatility quintiles. Results suggest that earnings yield (high E/P) and market illiquidity (low turnover) carry the most reliable gross premiums at the country level over the sample period, and that momentum is not a reliable factor. In summary, evidence from the past 16 years suggests that earnings yield and illiquidity are among the best indicators of gross country-level stock market performance, but momentum is not a good indicator. The sample period is short relative to many factor measurement intervals (only 16 independent one-year intervals). 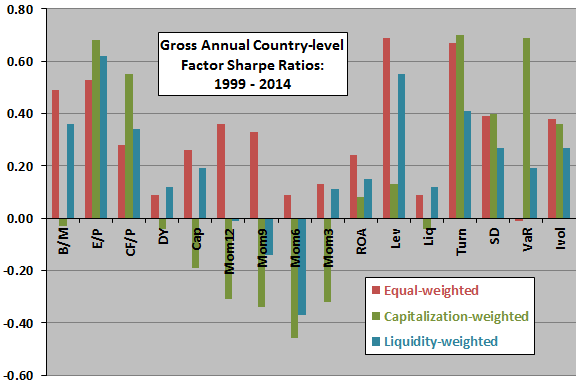 The small/large and open/closed country market subsamples are small for quintile formation. Testing many factors and weighting schemes on the same data introduces snooping bias, such that the best-performing strategies likely overstate expectations. The test assets are indexes rather than tradable funds, ignoring the costs of maintaining liquid funds and thereby overstating series returns. These costs probably vary substantially across countries. The study does not account for trading frictions associated with monthly reformation/rebalancing of quintile portfolios. These frictions would lower returns and may vary considerably across countries.